I have discovered on Facebook this amazing Romanian photographer named Stefan Bela and I believe his photos show the real Romania. Discover rural Romania through the lenses of his camera, I did and I saw amazing things. Click on each photo to see album. Bucharest, the largest city and capital of Romania is an architectural puzzle, where French 20th century palaces intermingle with boxy communist style buildings and modern glass towers. Bucharest is prettier, nicer, safer and more modern than you imagine. It is crowded and noisy as any capital, it has a great art scene, vivid night life, a remarkably tumultuous history, friendly warm people, mouth watering food and many touristic and not so touristic sites that are dying to be discovered. 1. Be amazed at the Parliament Palace, the second largest building in the world after the Pentagon. Called by the locals the ‘House of the People’ as it was constructed by the people with their own money for the megalomaniac communist leader Nicolae Ceausescu (1918-1989). Marvel at the ginormous building that was built on the site of an entire residential district and if you dare take the inside guided tour (don’t forget to bring your passport). 2. Tour Cotroceni Palace for a dazzling hour of Royal flamboyance. Built by a team of French architects in the 19th century at the demand of King Carol I of Romania, this Classic Venetian castle features a number of function rooms; many of which were decorated to the whims of Queen Marie, the English wife of Carol’s heir. You will also be able to view her astonishing art collection. 3. Explore Revolution Square for impressive architecture and a great history lesson. 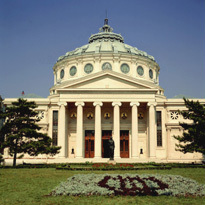 Revolution Square is located on Victory Avenue near the Romanian Athenaem – Bucharest’s Concert Hall for Classical Music, former Royal Palace which is nowadays the National Art Museum and the grand University Library. This area has a special vibe and meaning representing the freedom of the people from the monster of communism in December 1989. 4. Princely Court of Vlad The Impaler aka Dracula. In a small corner in the Old Town of Bucharest lies the ruin of Vlad Dracula’s Castle. You will be surprised to know that Bucharest was actually founded in the 15th century by this Romanian hero, when he was in need of a fortress protecting him from the Ottoman Empire. 5. Take a walk in Bellu Cemetery to admire the great pieces of art that decorate the tombs of Romanian noblemen, writers, artists, scientists and politicians. You can spend half a day wandering around the small alleys that tell so many stories and legends through life size statues, intricately embellished mausoleums and surprising items like the wing of an airplane decorating the resting place of a pilot. 6. Do some reading in the most beautiful bookshop in Europe. Carturesti Carousel bookstore located in the Old Town of Bucharest was opened in a superb historical mansion formerly called the ‘Carousel of Light’. Enjoy the great architecture, have a tea or coffee and flip trough books, music and souvenirs. 7. Spend the night at Cismigiu Hotel on the Broadway of Bucharest. The history of this hotel started in 1912 when it was called Palace Hotel and housed in it’s 200 rooms all the celebrities and officials visiting Bucharest. Take a walk on Regina Elisabeta boulevard to admire the Belle Epoque buildings and don’t miss Cismigiu gardens – Bucharest’s oldest park, after which the hotel was later named. 8. Indulge your music loving self with a concert at the Romanian Atenaeum. With wonderful acoustics, very talented musicians and an edifice that resembles a palace rather than a concert hall, you are definitely inn for a symphonic treat. 9. Have dinner at Caru cu Bere, the best traditional Romanian restaurant in Bucharest. Have dinner in this 1899 amazing beer hall built in Neogothic style and richly decorated with frescoes, stained glass windows, mosaics and wooden carved paneling. Try Romanian dishes like ‘Sarmale’ cabbage rolls stuffed with minced meat and polenta on the side, pork knuckle and sour krout, stews, soups and the freshest salads. Do not forget to try their house made beer or a glass of Romanian wine and last but not least, a piece of Chocolate cake that will make you to never forget this place. 10. In the evening explore the Old Town which comes to life after dark (no vampire pun intended ;). Have a drink at SkyBar while admiring Bucharest from above, make a stop at the Shoteria for a special drink or at Bicicleta (Bicycle) for a tasty smoothie. A story of kings and queens living in their fairy-tale world opens up before your eyes upon arriving in the area of Peles Castle. It served as a royal summer residence to the kings of Romania starting late 19th century. Built by King Carol I of Romania, it was very modern for it’s time – the first castle in Europe to have electricity and also central heating, central vacuum cleaning and an intricate architecture. It is one of the most beautiful, interesting and fascinating castles in Europe and definitely Romania’s No 1. Located in the town of Sinaia, which is one of the best mountain resorts in Romania, this castle will not disappoint as it is worth visiting both on the exterior admiring the vivid mountain landscape, the grand statues that guard the gardens to the out-of-this-world interior where French, German, Austrian, Italian, Turkish and Moorish styles intermingle to create an unique design which will charm and impress you. Open: Wednesday 11:00 AM to 05:00 PM; Thursday through Sunday, from 09:00 AM to 5:00 PM. Open: Tuesday 11:00 AM to 05:00 PM; Wednesday through Sunday, from 09:00 AM to 5:00 PM. *Please note that Peles Castle is closed during the whole month of November for restoration. Check the castle website for the exact dates closer to November. *Ticket office closes at 04:00 PM, last entrance for Standard Tour is 04:15 PM. *Ticket office closes at 04:00 PM, last entrance for Extended Tour is 03:15 PM. Peles Castle (Castelul Peles) is located in the town and ski resort of Sinaia (44 kilometers from Brasov and 122 kilometers from Bucharest). Address of Peles Castle: Muzeul National Peles, Str. Pelesului, Nr. 2, 106100 Sinaia, Jud. Prahova. You have to take European road E60 aka national road DN1 from Bucharest – Ploiesti – Comarnic – Sinaia. The average journey time between Bucharest and Sinaia is 1 hour and 56 minutes and the fastest journey time is 1 hour and 29 minutes. On an average weekday, there are are 16 trains trains per day travelling from Bucharest to Sinaia. The journey time may be longer on weekends and holidays. The first train from Bucharest to Sinaia departs at 05:53. The last train from Bucharest to Sinaia departs at 23:30. Trains that depart in the early morning hours or very late evening may be sleeper services. is today a bustling metropolis. His flute playing reportedly dazzled the people and his hearty wine from nearby vineyards endeared him to the local traders, who gave his name to the place. Bran Castle t his famous and legendary site, that spikes our interest every time we hear about it… Is it really as tremendous as it’s fame? Is Bran Castle worth visiting? As a tour guide and tourist as well, I say ABSOLUTELY YES. I have been through every corner of this castle so many times I cannot even count, I have stopped and looked at it from afar and up close and it is simply astonishing. This castle has played so many roles, from medieval fortress to royal residence; it must have seen so many courageous battles and fearless knights, withstood many violent attacks and horrendous enemies. You should not be expecting luxury as it was a defense fortress, you should not be expecting cobwebs and kitsch decorations. This castle has an impressive Gothic architecture that has been enhanced over the centuries, it has a beautiful location in a mountain pass and history that won’t disappoint. Admission is free for disabled persons and for institutionalized persons. Seniors admission is valid for people over 65 years. Students and pupils require to display their StudentID. Bran Castle is sited at the entrance to the Rucar – Bran passage, on the road connecting Brasov to Campulung, overtowered by the peaks of the Bucegi and the Piatra Craiului Mountains. Bran is less than 30 km far from Brasov, when following the national route 73, which leaves Braşov by its West end, through the Bartolomeu district. The distance to Bucharest is of less than 200 km. 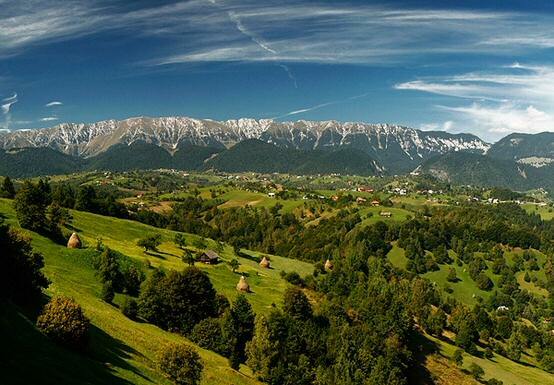 Due to its lovely landscape and charming people, Bran-Moeciu is one of the most popular touristic areas in Brasov County and the ideal place to spend a great week-end or your holidays. One can say that nature has been generous with this area because it is surrounded by the impressive silhouettes of the massifs Bucegi and Piatra Craiului, two of the most important elements in the Romanian mountainous touristic scenery. The landscape from this area is a harmonious mixture of different land forms (high mountains, plateaus, the curvy shapes carved by the rivers along their banks and the valleys that cross the land, shaped by the rich hydro-graphic network). From Bucharest, head north on DN1/E60, pass by Ploiesti, continue to follow DN1/E60, after Azuga turn left on DN73A, at Rasnov turn left onto DN73/E574, drive 10KMs and Bran Castle will be on the left. From Brasov, head northwest to Rasnov on DN73/E574, continue straight to Bran, castle will be on the left. The access by train is possible only up to Brasov. From Brasov you can transfer to bus service or pick-up the taxi service. More details in the Bus/Taxi tabs. Bus terminal No. 2 Brasov, provides regular rides between Brasov and Bran – Moeciu and return trips, with departures at every 30min, and at every hour during weekends. A ride to Bran Castle from Bucharest, takes about 2.5hrs drive. At Otopeni-Bucharest Airport there is a taxi station right in front of the international arrivals. From Brasov to Bran, Bratax.ro provides taxi services in cars with A/C, English speaking taxi drivers, with a professional conduct and attitude.